I had a lovely trip to London at the start of the summer break with my BFF J. (and you probably recall the book shopping and the results of that lack of control…); and part of the visit involved dropping in to the British Library to see a little display of Karl and Eleanor Marx items. Karl, of course, I first read decades ago when I picked up The Communist Manifesto, with a little trepidation, and was relieved to find I didn’t feel thick and it made perfect sense. His daughter Eleanor had I think been on my radar long before that; I stumbled across the Russian Revolution when we studied it at school, and around that time there was a BBC drama based around Eleanor’s life which I watched. This obviously focused on the dramatic and romantic side of her life, and it seems to often be the tendency that people remember the scandal and her suicide rather than her achievements. The book is 57 pages long and sets out to reclaim Marx’s politics from her personal life. On the plus side, it’s concise, puts her life in context, gives a good outline of her work and acts as an excellent introduction to Eleanor Marx’s achievements. She was living in interesting times: much of the life and work of the Marxes was informed by events in France; the Paris Commune of 1871 had a profound effect on left-wing thinking in Britain, and Eleanor translated a first person account by Propser-Olivier Lissagary, amongst other things. She was very much ahead of her time with her anti-imperialistic outlook and her recognition of the political division between working-class and middle-class feminists with their differing focus and needs. However, I’m not sure I concur with her assertion that women’s interests were best served by them taking part in a working-class revolution alongside men and not one of their own; if that was the case, I think we wouldn’t have needed the Suffragettes and the various waves of feminism that recurred through the twentieth century. I’m afraid I don’t agree that all men of any class are necessarily going to agree to live, work, earn and revolt on equal terms with women – even in the twenty-first century. But that’s just cynical old me. “The Rebel’s Guide…” was interesting in many ways, and it gave me a strong sense of the world and events Marx lived through, and occasionally her part in them; but the problem was I got no real sense of the woman herself, and the book was too wide-ranging in its focus, not really pinpointing her achievements enough for my liking. There was a tendency to set the political scene, relate the events of the time (and these were all fascinating) and then mention Marx’s involvement as almost an afterthought. I can understand the need to redress the imbalance of coverage only being of Marx’s personal life, but this went so much in the other direction that she appeared a little ghost-like in her own book, popping up here and there to become involved in the action but not really taking on enough of a presence. Was there another country in the world where the class barriers were so high as in England, and where it was so loudly proclaimed that none existed at all? As I mentioned, I was so intrigued to stumble across Ellen Wilkinson’s “Clash”, particularly when I read about her fascinating background and impeccable left-wing views. She lived such an inspiring life, and it seems, from reading “Clash”, that much of the novel draws from her own experience. The books tell of the adventures of Joan Craig; like Wilkinson, she’s from a working-class background, fiercely left-wing and committed to working for the cause. Joan is a trade union organizer and the book is set in 1926, on the eve of the General Strike. This was a strike that lasted for 9 days, when the country ground to a halt as workers from all industries came out in support of miners whose wages and working conditions were appalling. The strike in effect failed, as the Government were prepared and drafted in blacklegs from the middle classes; their organisation was better and they could hold out against the workers for longer, leaving the latter no option but to give in. However, the General Strike has gone down in to history as formidable display of working class solidarity, as well as contributing to an upsurge of support for the Labour Party. “And wasted, as though the sole use of it was to grub it out of the ground as quick as possible and chuck it at any price to anyone who’ll have the stuff,” added Royd. Excitement was rising. These men, Joan thought to herself, were in the centre of a crisis in which actually they, working men, were being consulted and had to give the final decision. In all the history of their class, wars had been decided for them. Their job was to fight and die. At the most they could but grumble under their breath. But now Cabinet Ministers were waiting to see what they would do, and whether their decision was war or peace. That description perhaps makes this work sound a little trivial, but frankly it’s anything but. The backdrop to the personal story is actually as gripping and involving as anything else in the book. We witness the excitement and tension of those organizing the strike; the difficulties of pulling together multiple trades unions, all with differing agendas; the complexities of deciding where your loyalties lie; the disappointments when things don’t go as planned; and the temptations which can draw a person away from their beliefs and commitments. The scene at the Memorial Hall reminded Joan of a beehive. Men were pouring in, while others were pushing themselves out. Communists, single-taxers, credit-reformers, were trying to push their papers on the delegates. Unemployed sandwich-men paraded in front of the hall. Press photographers tried to lure the big-wigs to pose. The inevitable mild -middle-class lady gave out leaflets on birth-control. A little apart from the hubbub a typical group of London workers looked on with their usual air of cheerful detachment. A taxi-man, wearing his union button, surveyed the scene with immense benevolence. Importantly, Wilkinson uses her story to embrace some very important and relevant issues for women. With remarkable foresight, she shows the personal and political as being inextricably linked; I was reminded of the slogan “The Personal is Political” which came to the fore during the second wave of feminism, and it’s clear that Wilkinson believes that you can’t behave in your personal life in a way that contradicts your political beliefs. Joan is a woman with a major dilemma: she loves Tony, but he wavers constantly, wanting her to be his mistress at one point and then when he finally commits to the idea of a divorce, insisting that she would have to give up her work. Gerry, on the other hand, would be the perfect work companion but Joan’s feelings for him don’t have the passion that she feels for Tony. Joan eventually reaches a resolution although, according to the introduction to the Virago edition by Wilkinson’s biographer Betty D. Vernon, Ellen herself never did. London, Parliament, the folks that make laws and regulations, are afraid of the miners and the steel-workers and the other manual workers. They must be kept poor, or they mightn’t stick at their jobs, they must be kept ignorant of their bodies or they mightn’t produce enough cheap labour, they must be kept overcrowded when slums could be swept away in five years, because, oh why – because we must have some one to look down on, just as we won’t give them enough State hospitals for fear we shan’t be able to give ourselves the luxury of feeling charitable. These are not the only relationships affected by the Strike, however. That action ends halfway through the book, but Wilkinson goes on to show the aftermath: workers being exploited as the try to go back to work, fund-raising efforts, women in small industrial towns who don’t know the first thing about birth control and struggle with multiple children, and the yawning gap between the haves and the have-nots (plus ça change…) The effects of the Strike on relationships in all classes is profound, and Wilkinson’s characterisation is not black and white; Mary Maud is rich but with a heart that is in the right place and wants to help; Helen Dacre is upper class and initially nasty but becomes more human when her side of things is given; gossip columnist Palma is initially snooty but revealed to have left-wing sympathies. This nuanced approach allows Wilkinson to produce a riveting story that embraces left-wing politics, feminism and the struggle to balance work and love. Mary Maud was a wealthy bachelor woman, an intimate of an exclusive Bloomsbury circle who bestowed fame on themselves by writing reviews of each other’s books. As each slender work appeared it was greeted as a new Tchehov, a more sensitive Dostoievsky, a respringing of the fountain of Shelley’s genius. The book also has a strong message about the need to be vigilant; Wilkinson obviously felt that there should be no compromises and warns against the dangers of being seduced by comfort and drawn away from the struggle; Joan is tempted by the possibility of a different life that would blunt the edges of her combativeness and wish to fight for her cause, and I got very tense waiting to see what the resolution would be. Wilkinson’s only political novel (“The Division Bell Mystery” is a crime story, and the politics are nothing like this from what I’ve read so far) is a real winner. It’s exciting, emotional and gives an eye-witness view of a time when working people came together to try and fight for a fairer world. That attempt failed, mainly it seems because the strikers had a desperate need for proper organisation and a more sweeping overview; and in some ways, with the ridiculous in-fighting plaguing the left today, that still seems worryingly relevant. Little changes, and I was vaguely depressed to see one miner character comment about the closing down of the press: “That’ll larn the “Daily Mail” – it seems that particular rag was a problem back in 1926… “Clash” never hides its politics, but those politics give the book an importance and stimulation for discussion which so many works lack. It was definitely a worthy choice for Virago to republish in 1989, sixty years on from its original publication date; and it’s definitely worth tracking down today if you want a novel that will stimulate, engender debate and make you wonder how much we’ve moved on in what is nearly a century since that great coming together of the working class. You’ll notice a lot of quotes in this post, and I could have pulled out so many more; this is a book that’s really had an effect on me and it’s one of the most important Viragos I’ve read. As I mentioned in a recent post, I had a bit of bookish luck whilst on my travels to visit Family when I stumbled across a lovely old green Virago – “Clash” by Ellen Wilkinson, an author I’d only recently come across when I received a review copy of her newly reprinted British Library Crime Classic “The Division Bell Mystery”. Delving a little deeper has revealed that Wilkinson really *was* a fascinating woman. Coming from a poor Manchester background, she nevertheless attended university, became a Communist and a trade unionist, joined the Labour Party, supported the 1926 General Strike, became Labour MP for Jarrow (and was therefore heavily involved in the iconic Jarrow March), visited Russia and war zones – well, that just scratches the surface. What an inspirational woman and what a life! I’m currently reading “Clash” and finding it completely absorbing and, depressingly enough, still very relevant. The beliefs Wilkinson gives her protagonist Joan Craig are ones I can really empathise with, and the book is really compelling. She was desperately tired, too tired even to make the effort to get back to Gordon Square. The thrills of the day, following a night on the train, had left her utterly exhausted. There came to her at that moment the queer clearness of vision that sometimes happens when the body falls asleep of itself. Through the chatter of the crowded restaurant she seemed to see England – the great steel towns of the north, the mining villages she knew so well, the little homes in which she had stayed during her organizing tours. Decent men and women working far too hard, crowded together in uncomfortable homes. Lack of obvious things like baths and hot water, lack of comforts, and, for at least five years, lack of food and warm clothes. What fine stuff they were, what excellent material out of which to build a fine race. And instead . . . muddle. Those men and women of the employing class meant well, no doubt, some of them, but, oh, their hauteur, their assumption that people, because they were manual workers, were of an inferior race! The unblushing lying to preserve a competitive system that the really intelligent among them knew was breaking down, the refusals to organize or to allow resources to be organized except on a basis that would yield excess profits to some one! They wanted inequality. They could not conceive a society without some one to bow before and others to cringe to them. The Socialist ideal of a commonwealth of equals “simple in their private lives and splendid in their public ways” made no appeal to the class that governed England in 1926. The bolder of them wanted a world in which they could gamble. The timid wanted security – Government bonds and six per cent. So it rather seems that back in 1926 it was all about the few taking what they could from the many, and it’s shocking and saddening to find that nearly a century later little has changed. I find myself fascinated by Wilkinson and her writings, and I really do think I may head straight on to reading “The Division Bell Mystery” straight after this one! As a rule, I don’t generally have disastrous reading experiences. Life is too short to waste on books you don’t like so I try to tailor my reading to things I actually want to read or hope I’ll get something from; or to continue the ongoing search for those works which change your life. However, I had a less-than-pleasant encounter with Angela Carter during our week of reading for the #1977club, when I found “The Passion of the New Eve” to be most unpleasant with no redeeming features. This *did* irk me a bit, because I’ve enjoyed her work in the past; so, as Carter is the author of the month on the LibraryThing Virago Modern Classics group, I resolved to try again, and picked up “Fireworks” a slim volume of short works. First published by Virago in 1988, the book collects works that span a number of years, some as early as 1974 (though it isn’t specified which is dated when). I had previously read, and been intrigued, by the opening story “A Souvenir of Japan”; and indeed several of the stories seem to be set there (and apparently draw heavily on the period Carter lived there in the early 1970s). There are nine stories here, all very disparate in subject but all very much in Carter’s style. I speak as if he had no secrets from me. Well, then, you must realize that I was suffering from love and I knew him as intimately as I knew my own image in a mirror. In other words, I knew him only in relation to myself. Yet, on those terms, I knew him perfectly. At times, I thought I was inventing him as I went along, however, so you will have to take my word for it that we existed. But I do not want to paint our circumstantial portraits so that we both emerge with enough well-rounded, spuriously detailed actuality that you are forced to believe in us. I do not want to practise such sleight of hand. You must be content only with glimpses of our outlines, as if you had caught sight of our reflections in the looking-glass of someone else’s house as you passed by the window. I don’t know if it was just that I was in the right mood this time, but I found myself seduced by Carter’s prose from the very start. The stories cover much ground – the complexities of personal relationships (“A Souvenir…”, “Flesh and the Mirror”); myth, legend and brutality in far countries (“The Executioner’s Beautiful Daughter”, “Master”); morality (or lack of it) in disintegrating landscapes (“Elegy for a Freelance”, “Master” again); being an outsider, the ‘other’ (“A Souvenir…” again, “The Smile of Winter”); plus strange and haunting works which draw on fairytale and fantasy (“Penetrating to the Heart of the Forest”, “Reflections”, “The Loves of Lady Purple”). These stories are disturbing and beautiful and I found myself lost in other worlds brilliantly created by Carter in astonishing prose. These tree trunks bore an out-crop of plants, orchids, poisonous, iridescent blossoms and creepers the thickness of an arm with flowering mouths that stuck out viscous tongues to trap the flies that nourished them. Bright birds of unknown shapes infrequently darted past him and sometimes monkeys, chattering like the third form, leaped from branch to branch that did not move beneath them. I mentioned brutality and yes, there is violence (emotional, physical and sexual); however, I didn’t have quite the problem with it that I did reading “Passion…” Maybe I recognised that it was necessary here for the stories Carter was telling; maybe the storytelling was so strong that I could see the point; or maybe her beautiful writing counterbalanced the darkness and provided a necessary harmony in her work. Certainly Angela Carter’s prose was just stunning in these tales; hypnotic and haunting, it convinced me that I hadn’t been wrong in my belief that I had loved her work previously – and still can and do. The stories are multi-faceted, multi-layered things of beauty and cruelty, and I think that a second reading would pull out many more references and resonances than I saw on my first read. I had fallen through one of the holes life leaves in it; these peculiar holes are the entrances to the counters at which you pay the price of the way you live. Picking favourites is always difficult (and maybe controversial!) when reading a collection of short works, but I have to mention in particular “Reflections”; this wonderful and dark fairy tale, drawing on mythology, had the most amazing imagery and the pictures it painted in my head will stay with me. Observant readers of the Ramblings may have noticed a certain tendency over the last few months towards France, Paris and the various revolutions that have taken place (stirred in with an interest in iconoclasm!) I’ve read (and amassed on the TBR) a number of books on the subject, and all of this is so interesting; however, one thing I’ve been looking for and struggling to find amongst all the revolutionary hyperbole is the female voice. Women were a huge part of the French Revolution: from Théroigne de Méricourt who shamed the men into storming the Tuileries Palace* to the tricoteuses, knitting away beside the guillotine (all that blood really must have messed up their work…) Anyway, as I dug into the subject, looking for what women had written during the period, one name kept coming up – Olympe de Gouges. A little more digging revealed a woman with a fascinating history: born in 1748, she started her career as a playwright; however, as France edged closer to revolution, Olympe became more involved in politics, initially taking a strong stance against the slave trade in the French colonies. This mutated in pamphleteering and once the Revolution took hold, she wrote a pioneering feminist work, Declaration of the Rights of Woman and the Female Citizen (1791) challenging male authority and the inequality of the sexes. However, the Revolution was never straightforward and because of her association with a Royalist party she was eventually guillotined in 1793. She had argued that there should be equality for both sexes in every respect and France’s method of execution was to be no exception. Naturally, I was keen to read Gouges’ work, and I was really happy to find that Ilex Press were bringing out a new edition, and the publisher has been kind enough to provide a review copy. And what a fascinating and inspirational little book it is! The “Declaration” itself is relatively short, so they’ve cleverly decided to enhance it with the United Nations Declaration on the Elimination of Discrimination against women (which drew on much of Gouges’ work for its substance) as well as a marvellous series of illustrations and some stirring quotes from writers as wide-ranging as the well-known Woolf, Beauvoir, Shakespeare and Rimbaud, plus a number of names (often French) new to me. These really do bring the book alive and it makes potent reading. Yes, indeed, gentlemen – you who are such authorities on the internal workings of the soul and the psyche – reading does give women ideas. What sacrilege! How then are we to stem the flow of pleasure that reading brings to women? I’m old enough to remember second wave feminism in the late 1970s – consciousness-raising groups, Spare Rib and Reclaim the Night marches – and the demands we were making then don’t seem that dissimilar to the ones Gouges made or those in the UN resolution. And although we are supposed to have made great strides forward in equality of pay and work conditions and the like, the recent news stories about the gender pay divide as well as the #metoo phenomenon tend to make me think we have not. When a book like Mary Beard’s “Women and Power” strikes such a chord, it’s certain that we are still far away from equality. Only a man could launch the idea that the happiness of a woman should consist in serving and pleasing a man. Olympe de Gouges’ eventual fate was tragic, particularly bearing in mind her views and her intelligence. 1793 saw the Reign of Terror and a spate of executions spreading across France, and it’s timely to be reminded that so often a revolution is man-made and for men only – as Wikipedia points out, “1793 has been described as a watershed for the construction of women’s place in revolutionary France, and the deconstruction of the Girondin’s Marianne. That year a number of women with a public role in politics were executed, including Madame Roland and Marie-Antoinette. The new Républicaine was the republican mother that nurtured the new citizen. While politically active women were executed the Convention banned all women’s political associations.” It’s a tendency that’s repeated over and over again; after the Russian Revolution, the women who supported it struggled to get their needs and views taken into account; and in the so-called liberated 1960s counter-culture, the women were meant to take a subservient Earth-mother role (which probably sparked much of the second wave of feminism). However, this was particularly galling in the case of the French Revolution, a conflict in which women were very much to the fore. Colette’s thinking is guided neither by the imperative of the reproduction of the series, nor by the imperative of social stability assured by the couple and the assurances they make. The only constant is her concern with the freeing of the subject ‘woman’, who wishes to attain sensual freedom in order to maintain her curiosity and her creativity, not as part of a couple but in a plurality of connections. Those of you who happen to follow me on Twitter might have noticed my recent excitement at stumbling over a bit of a bargain in a charity shop; namely a lovely pristine copy of Mary Beard’s “Women and Power” for 50p… As I commented at the time, truly some charity shop staff don’t quite know what they’re doing! However, I was happy with my bargain as I’ve been keen to read this since gifting Middle Child a copy at Christmas time, and as I wasn’t feeling like launching into one of the big fat fiction books I’m facing right now, it was the right book at the right time. Beard is a well-known academic who makes regular appearances on TV as well as holding down an impressive teaching commitment; she’s also attracted a disproportionate amount of negative online comment, which serves to highlight just how far we still have to come with regards to gender stereotypes and expectations, and also how unpleasant certain online areas can be. Nevertheless, she continues to be erudite, outspoken and inspirational, and this book reflects both strands of her experience. The book has its genesis in two lectures she gave, one in 2014 and one in 2017, for the London Review of Books, and it’s a powerful polemical read which draws not only on Beard’s knowledge of classical antiquity but also her personal experiences of making her way as an educated, intelligent woman in a man’s world. In simple terms, Beard is looking at the struggles women have in taking positions of power, how ingrained the attitudes of men are towards this, and how it is pretty much impossible with the current set-up to attain any kind of equality. The traditional power systems of the modern world are a male construct and Beard’s basic point is that the only way a women can get ahead in the power structure of our world (and indeed in the worlds of the past) is by aping a man; that’s what the system demands and that’s the only kind of behaviour the men in power recognise. So to change the balance, and in fact change the world, we completely need to remake it. You cannot easily fit women into a structure that is already coded as male; you have to change the structure. In presenting her arguments, Beard quotes some mind-numbingly awful behaviour from the classics (who knew Homer featured such hideously mysogynistic stories???) and then brings the representations of behaviour towards independent women starkly up to date with examples of how the imagery used has been hijacked by modern politicians – the image of Trump as Perseus and Clinton as Medusa is one I hadn’t seen and it’s truly shocking. Beard also takes a look at Charlotte Perkins Gilman’s “Herland”, which despite its pioneering viewpoint has drawbacks in taking on the traditional male power structure. Here, even a successful female utopia has to be made in isolation; its creators regard themselves as failures and once contact is made with the (male) outside world, it isn’t long before this oasis of female good sense unravels. Beard’s argument is a persuasive one, and despite semi-humorous (but very irritating) assertions from members of my family that if the development of the world had been left to women we wouldn’t have any progress (Ada Lovelace, anyone??? ), I do find myself wondering what it would take to make a radical change in our society so that women can be accepted in positions of power, high up in the working world and generally everywhere they want to go – certainly the dismantling of the political Old Boy Network would need to happen. I should say here that I work in a pretty much all female environment, with intelligent, strong women in charge and it’s actually a wonderful place to be. And it’s interesting to watch the varying reactions of the men who come into that environment which range from admiration, curiosity and recognition to condescension, hostility and outright dismissal. Until we’re all on the same side things will not change. It’s getting on for 40 years since I first read the work of Sylvia Plath (which is a fairly alarming acknowledgement! ); back in the world of 1970s feminism, she was the go-to author for discussion of the female condition and the changes taking place in women’s lives in the relatively recent past. But it’s a long time since I read any of her fiction; I seem to be reading more books about her than by her recently, and it’s been on my mind that it was time to pick up “The Bell Jar” again, to find out what I made of it at such a distance from my first experience of the book. And so the time was right for a re-read of Plath in my trusty old Faber paperback. 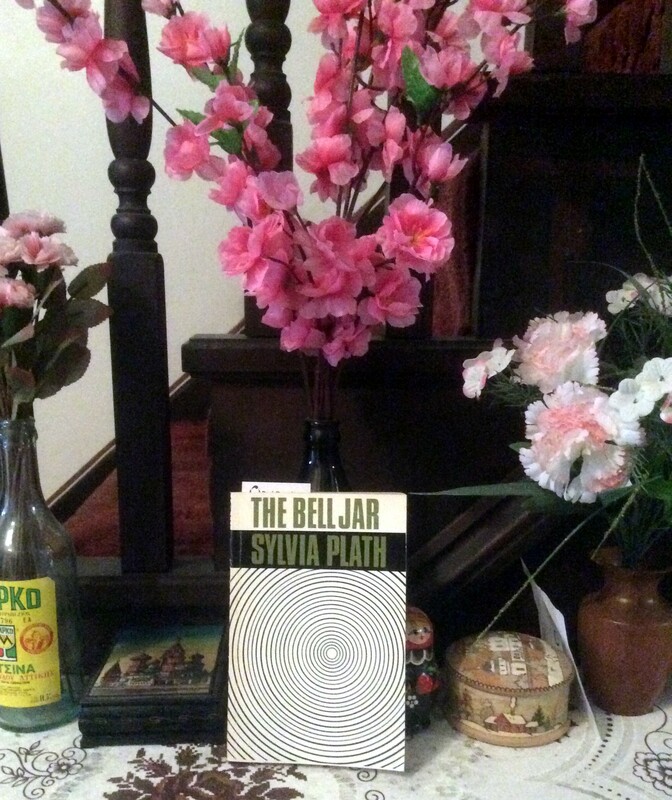 “The Bell Jar” is Plath’s only published novel, and it’s widely regarded as autobiographical, telling the story of Esther Greenwood, a young American girl spending a summer in New York on a placement with a magazine. Coming from a New England town, Esther is struggling to cope with the city; she’s naive in many ways, and doesn’t really fit in with the ‘fast’ girls, though she’s too worldly for the small-town girls. Isolated from both groups, she finds herself slipping behind, failing to meet deadlines and beginning to lose the impetus to make a success of the opportunity she’s been given. Back in her home town for the summer, Esther starts to spiral into depression when she isn’t accepted onto a writing course. Having sailed through her schooling up to this point, failure is not something she’s used to dealing with. As the hot summer plods on, Esther does to, trying to find some kind of direction and focus. Her mental state deteriorates to the point where she can’t sleep and stops washing, and so begins the record of her treatment at the hands of a series of medics of differing talents and sympathies. The first doctor is a disaster, administering shock treatment incorrectly which leads to a suicide attempt. Eventually, through the help of a benefactress, she is placed in a more sympathetic environment, with a doctor who is more understanding and Esther begins to work through her illness. In the clinic she meets a school friend, Joan, who’s also made a suicide attempt; the meeting will be pivotal as one girl will make her way back to the world and one girl will not. In many ways, I find it hard to talk about “The Bell Jar”; it’s such a remarkable novel, powerfully written and very affecting. Plath builds a convincing picture of Esther Greenwood, the small-town overachiever who finds herself out of her depth and sinking in the Big Apple. She charts the ups and downs of her emotions, her development as a young woman and her struggle to find a role for herself. Running through all this is the dilemma in which many women found themselves during the 1950s – their road through life was no longer obvious, and they were struggling to choose between the traditional role of wife and mother, or the longing for a wider path. From the tip of every branch, like a fat purple fig, a wonderful future beckoned and winked. One fig was a husband and a happy home and children, and another fig was a famous poet and another fig was a brilliant professor, and another fig was Ee Gee, the amazing editor, and another fig was Europe and Africa and South America, and another fig was Constantin and Socrates and Attila and a pack of other lovers with queer names and offbeat professions, and another fig was an Olympic lady crew champion, and beyond and above these figs were many more figs I couldn’t quite make out. It’s an issue that’s relevant to women today, despite all the so-called advances; we still often have to make the choice between children and career in a way men never do, and we’re still encountering everyday sexism in the workplace. And it may well be that it’s the strain of being drawn in so many different directions with so many conflicts that exacerbates Esther’s mental decline. The book also stands, rightly or wrongly, as a strong piece of autobiography from Plath. Despite the fact it’s fiction, Esther Greenwood’s life is seen as shorthand for Plath’s, as it’s based on many events in her own life. It’s powerful and moving watching EG/SP go through these experiences, fighting against her emotional and mental hardships and coming out at the end – well, cured is not the right word, as I still had a sense that she was coping, maybe even playing the game, but remaining at odds with the world.